This was mentioned in the Judy Garland thread and I thought it deserved a thread of it's own. Is anyone else obsessed with it?! It is hilarious, I think I have seen just about all the 'segments' available on YouTube. It's SUCH a shame Kate never appeared, but at the same it wasn't really her thing to appear on television till later in life. Here is an example of what made What's My Line a Universally great television gameshow. Often the guests that were ordinary people were much more entertaining and funny than those with 'celebrity mystery guests'! One of my favourites, a "Girdle Salesman". FUNNY television! Love it. Live it. Google it. Darlin', What's My Line has been the source of so much entertainment in my life I don't know where to begin. Love that Dorothy Killgallen, The Gal Without A Chin. I could put the above to song. But I won't. Hahahaaaa.. girl, when one feels the need to break out into song, from my experience, it's usually better to just go with it. So if you feel the need, go for it. My favourite is Arlene Francis. She is gorgeous and funny and I'm jealous of her famous diamond necklace which of course was stolen in the 60s and shortly after, the US pubic felt so bad for her, they started sending in money to the studio so she could go and get a new one. Awww. But I love Dorothy cause she plays to win! You can see it in her eyes. And I love that she's the only panelist that makes notes! Obviously coming from her journalism experience. I think Fred Astaire's is my favorite WML of all time. Dorothy: "When you're walking down the street, do men whistle at you?" 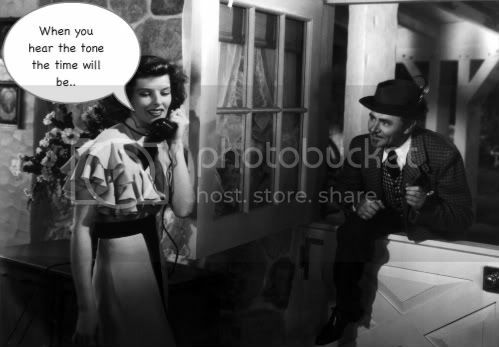 Whats My Line is the SHIZ. 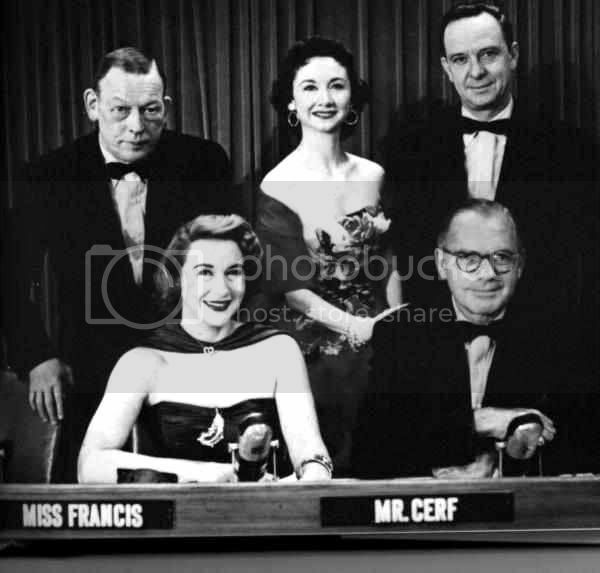 My personal fav is Bennett Cerf, AND Fred Allen. Although I love everyone on that show, as a collective. Too funny. 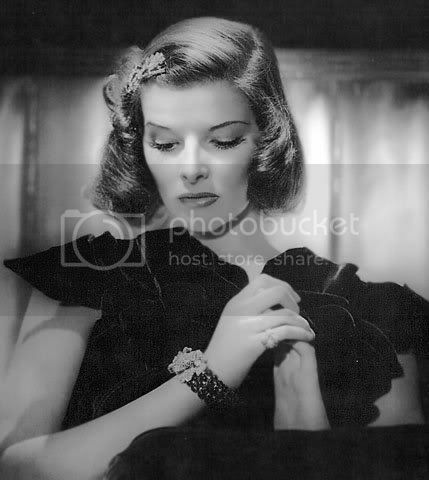 One of my favorites is when Rosalind Russel was on. I posted here somewhere. dorothy plays to win .. without humor. she is hilarious in her cluelessness. i read a bio of her last year .. she is woman who achieved a lot in her life, but yeah. humorless. but arlene. i've loved her since i was a little girl and she ruled the roost in the version of what's my line that was on in the late 1960s. she has humor and class and style and plays with the right attitude .. sure, try to get the right answer but in the name of fun she'll pass along and allow the mystery guest to get some promos in for their new film or play. i record it every night (game show network on at 2am in central time zone) and fast forward to the mystery guest slot at the end. such fun. i LOVE that. i had a little rhinestone version of the necklace when i was a little girl. ... would have been the mid 1960s ... yes, it was a fad of a kind inspired by our miss arlene. um, speaking of miss francis and that rhinestone necklace that was widely available in the 60s. .. cropped from a childhood portrait of me in my arlene necklace. i was 7 years old and just loving the "glamour" .. ha. OMG Martha, I'm so jealous! You must have been so popular! Do you still have it today? Martha, a Klenex, really haha glad I could bring some laughter to your day lol P.S. it's so cute how people call them Klenex. In Australia we have so many different brands, if we need one, we just call it "a tissue" lol same with water. Don't you guys call it Evian? We call it "a bottle of water" lol too cute! Okay What's My Line? lovers, here's a fairly new one posted on YouTube because I hadn't seen it before the other night. This has to be one of the best ones. It's Arlene's son as the mystery guest! So to all you Arlene lovers, here's to you too.. watch her reaction at the end. Priceless! And you're right about the Kleenex thing, but I still call them tissues. And I don't think I've ever even drank Evian so I just call it a bottle of water, too. But I remember when one of my best friends (who is Australian) first moved to America, and everyone kept asking her to say 'water bottle' because they loved the way it sounded with her accent! Hahaha, in These Economic Times "WHY, WHATEVER DO YOU MEAN GAS IS 3.45 AGAIN? LAAA LAAAAAAA LAAA I CAN'T HEAR YOOOOOU" I think most of us are spare-changing it for an Aquafina, let alone an Evian. Meaning, that tasteless elixir still falls under the "bottle of water" moniker over here.